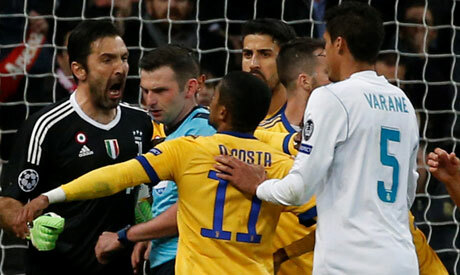 Italian referees' chief Marcello Nicchi said Monday that Juventus goalkeeper Gianluigi Buffon should think before lashing out at officials as he did during last week's Champions League defeat by Real Madrid. The 40-year-old Italian icon later called Oliver "a murderer" with "a rubbish bin" in place of a heart. "Buffon is a great champion who I hope will go on to have a great managerial career," Nicchi told Italian radio. "But at certain levels you have to be careful about what you say. There are always kids listening. "If it happened in Italy? I would have defended the referee. They can't be threatened either before, during, or after the game. "After that, there are the appropriate bodies which must judge the conduct of all players on the pitch." The Italian Referees' Association (AIA) could lose its two percent voting allocation in the Italian Football Federation's Federal Council. "To undermine the independence and impartiality of our referees could mean the start of a new Calciopoli," said Nicchi. "I'm doing everything to calm the referees, but if one day someone goes out on the pitch and doesn't find the referee, I wouldn't be surprised," he added of possible strike action.